Performance measurement is like anything else – you can do it anywhere on the scale between awful and awesome. How to figure out where on the scale you are? You have to start by defining what awful and awesome is, and that means defining the outcome of performance measurement. It’s not performance measures, nor dashboards, nor informed decisions. Those are just outputs. The outcome of performance measurement is that the right things are being improved, across the whole organisation or business, and regularly. How would you measure that outcome? The simplest measure I can think of is the percentage of people in the organisation who are regularly making measurable improvements in the performance results that are strategically important or mission-critical. This measure is called the Performance Excellence Score. How do you improve that outcome? You need to improve your approach to performance measurement to better engage people in measuring what matters, to give them better skills and tools to do it well, and to make it a more natural a part of doing their job. And to help you plan and monitor your progress, you can use your Performance Excellence Score and benchmark which stage you’re at on the Performance Measurement Excellence journey. Stage 1 is Appreciation. If your organisation or business is moving through the Appreciate Stage, it’s likely that there are few, if any, good measures of performance. People don’t understand what to measure or why they should do it. Measurable performance improvement is uncommon. Your priority is to give people reasons to appreciate the value of measuring performance. Stage 2 is Engagement. Here, more and more people are able to describe the mission-critical and strategically important results for the organisation or business and how they contribute to them. A few areas are attempting to measure and improve those results. Your priority is give people quick and easy ways to measure just a few useful things, to nurture their engagement in measuring. Stage 3 is Commitment. You’ll have some ad hoc areas measuring mission-critical and strategically important performance results, and some of the “quick win” performance improvements are generating interest among other areas. Deepen and broaden the commitment by teaching more people how to have similar successes with performance improvement. Stage 4 is Focus. The purpose of performance measurement as a driver of continuous improvement is understood more widely, and there are quite a few areas starting to use meaningful performance measures to improve performance. 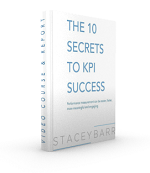 Share case studies of measurement successes to inspire and guide people, and put a lot of emphasis on aligning their measures with the strategic direction. These first four stages parallel the development of a performance culture that is nurtured through quick wins to raise awareness of what good performance measurement is really all about, and basic guidance in how to develop good measures. A reasonably strong performance culture is an essential foundation to lay before you worry too much about the technical side of measuring. Stage 5 is Alignment. A cross-section of people throughout the organisation are setting up performance measures that align to strategy, and they are using them to improve performance toward targets. It’s now time to develop a corporate-wide approach to performance measurement, test it, and get it ready to roll out. Stage 6 is Capability. Most of the organisation is using performance measures that align to strategy, with many areas showing real performance improvements and achieving targets. Here, your priority is to systematically train people in how to use your corporate performance measurement framework. Stage 7 is Integration. The alignment of performance measures to strategy and to business processes is strong. Improvement in process performance routinely leads to improvement in mission-critical or strategically important areas. Start embedding your performance measurement framework into business planning, strategy execution and performance reporting. These three stages happen when frameworks for an organisation-wide performance measurement approach are designed, tested and standardised. When you have a unified approach, it’s easier to deploy and to improve. Stage 8 is Evolution. Performance measurement is a natural part of everyone’s job, and they are consistently reaching or exceeding targets in mission-critical or strategically important areas. Set up the systems and routines to continually monitor how your performance measurement framework is working, treating it like you should any other formal business process. Stage 9 is Acceleration. At this stage, performance measurement is as natural a part of doing business as financial management. Performance measurement is managed as a formal business process that is, itself, routinely measured and improved to better achieve performance targets. The idea here is that you focus improvements in your performance measurement process on the outcomes of achieving stretch targets, faster and with fewer resources. This is performance excellence. These last two stages happen when there are well designed and implemented systems for formally managing and continually improving your performance measurement process as a natural part of doing business. Can you see how these stages logically build on each other, and that you need to be very careful about when and how you plan your journey to performance excellence? 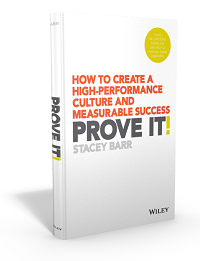 TAKE ACTION: Learn how to find out your current stage of Performance Measurement Excellence, and how to improve it. Then ask yourself this question: What are the best three things I can do in 2012 to move closer to performance excellence?